Also in the past we sometimes encountered images that we could not open in Photoshop. Recently we had some major issues here (read this note). If you have many images (100-10,000) it is not very practical to check each image manually. 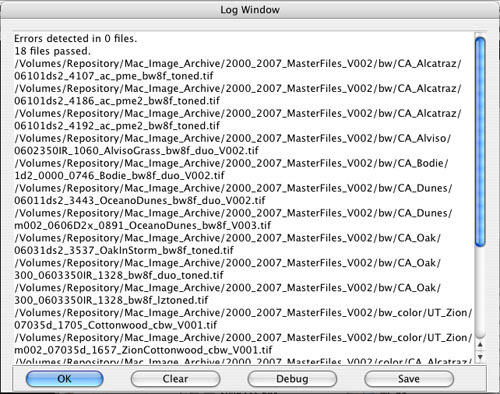 Then we discovered that the xBatch batch processor would log images with defects. This got us to ask master scripter xbytor to create a script that would try to open all file in a folder hierarchy and report failures. So here we are with the all new xScan script. Xbytor has written for our readers a free batch script that checks a folder hierarchy. The use of XScan is very simple . 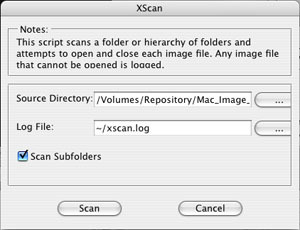 To launch XScan the use File->Scripts menu in Photoshop. Hit the "Scan" button and the script will work. Of course this can take quite a bit of time if you have many images (have a coffee or tea :-)). Note: For the current version the "Esc" to stop the script may not work. We either kill Photoshop (be sure you have saved all settings before) or wait patiently. 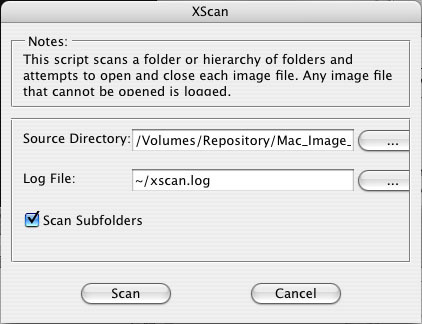 You can download XScan from here (version 1.3). We want to thank xbytor a lot for creating again avery useful script. We hope you agree that this is a very useful script that xbytor makes available for the Photoshop user community. We initiated the basic idea and xbytor did all the hard scripting work. XScan also demonstrates how powerful Photoshop scripting can be. Happy XScanning! For questions and comment please use our news groups. I have a long history in software engineering and photography. Scripting Photoshop has turned out to be excellent way to engage both of these passions. In addition to providing support to other scriptwriters on the Adobe Scripting Forum and ps-scripts.com, I also offer online consulting services for those in need of additional help. You can contact xbytor here.